WASHINGTON, DC, November 12, 2010 (ENS) – Small amounts of cancer-causing chemicals called dioxins were emitted during controlled burns of oil during the Deepwater Horizon BP spill, the U.S. Environmental Protection Agency said today, releasing two peer-reviewed reports on dioxins created during the burns. The results indicate that increased cancer risk due to exposure to the dioxins released from the controlled burning of oil was small – less than a 1 in 1,000,000. Dioxins are a group of hundreds of potentially cancer-causing chemicals formed during combustion of fossil fuels. Measurements made by EPA during the Deepwater Horizon BP spill in the Gulf of Mexico indicate that dioxins are emitted from the burning of oil on ocean water. Controlled burning of oil on the surface of the ocean, or in situ burning, was one method used by the Unified Command during the Deepwater Horizon BP oil spill, to reduce the spread of oil and environmental impacts at the shoreline. A total of 411 controlled burn events occurred, of which 410 could be quantified, resulting in the combustion of an estimated 222,000 to 313,000 barrels of oil. With support from the U.S. Coast Guard, EPA sampled emissions at the source of the controlled burns in the Gulf of Mexico to determine if dioxins were present. The sampling was conducted to identify potential dioxin exposures and determine the potential risks from inhalation to workers in the vicinity of the fires, risks from inhalation to the general population and risks to the general population from consuming fish caught in the area. The sampling device was attached to a balloon that could be tethered above the burning oil. Cables were used to anchor and remotely maneuver the balloon and the attached sampling device to collect gas and particle samples from smoke plumes. The same sampling device was deployed on the deck of the research ship to measure ambient air concentrations of dioxin. A composite sample of 27 plumes taken over a four day period resulted in the detection of dioxins above the ambient background levels. The average measured plume concentration, approximately 200-300 meters from the fire and about 75-200 meters above sea level, was less than 0.0002 nanograms per cubic meter. The first report summarizing EPA’s sampling efforts indicates that while dioxins were created from the burning of oil on ocean water, they were created at low levels – similar to the emissions from residential woodstoves and forest fires. The second report, co-authored with scientists from the National Oceanic and Atmospheric Administration, presents the results of a screening risk assessment for the dioxins emitted from the controlled oil burns. The results indicate that increased cancer risk due to exposure to the dioxins released from the controlled burning of oil was small – less than a 1 in 1,000,000 increased cancer risk. Additional cancer risks for inhalation by workers and onshore residents and fish consumption by residents were lower than risk levels that typically are of concern to the agency. The agency has a concern when the risk is greater than 1 in 1,000,000. Had the spill of oil continued, the EPA said, the results of these measurements would have been used by the Unified Command to determine if burning should continue. 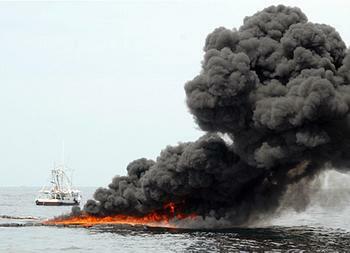 But the BP well was capped on July 15, 2010 and the last in situ burn occurred on July 19, 2010. EPA and other federal agencies have developed a broad set of questions and answers to provide the public with general information on dioxins, including what they are, where they can be found, and major sources of dioxins. The questions and answers explain the review process for the dioxin reassessment and discuss possible effects of dioxin exposure in humans, including advice about consumption of food that might contain dioxins. Click here for both reports and questions and answers about both reports. Click here for general information on dioxins.